Every Christian needs training. Without training, we will not experience and enjoy Christ’s riches in full. We also need training to function and serve the Lord profitably. 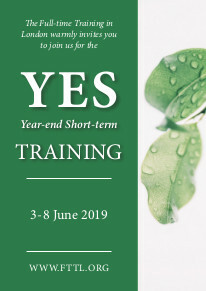 The Full-time Training in London provides a special opportunity to be trained to enjoy Christ, grow in His life, and serve Him to build up the church as His Body. The Full-time Training in London (FTTL) began in September 1997. The Training was established to help Christians grow in the divine life, be constituted with the truths of the Bible, develop their spiritual capacities (such as gospel preaching, nourishing new believers, perfecting the saints, and prophesying), and cultivate a proper character. Trainees are university graduates of all nationalities and backgrounds. In the course of the two-year programme, they take classes, participate in the outreach to children, young people, university students, or the community, and serve in practical areas. The goal of the Training is to foster living, functioning, overcoming members of the Body of Christ for the fulfilment of God’s eternal purpose. This Training is conducted in fellowship with the Full-time Training carried out by Living Stream Ministry in Anaheim, California, and with the other trainings throughout the globe.